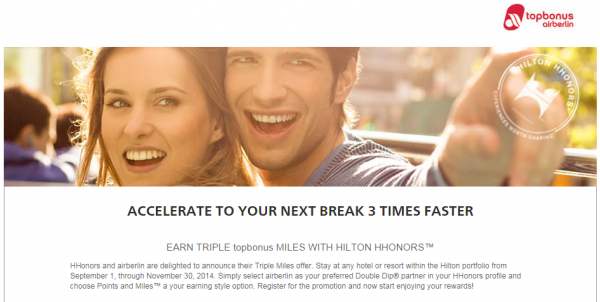 Airberlin Topbonus members can earn triple miles for Hilton family of hotels stays worldwide between September 1 – November 30, 2014. You normally earn 1 mile per USD spend and this is tripled to 3 miles during the promotional period. Note that you must choose Hilton HHonors Points + Miles Double Dip option and have Airberlin Topbonus chosen as the preferred program. So, you must choose earning between an additional 5 Hilton HHonors points per USD spend or 3 Airberlin Topbonus miles. I would only choose Airberlin Topbonus if you are trying to recah number of miles for a reasonable award redemption. To be eligible for this offer, you must be (1) be a member of HHonors; (2) select airberlin as your preferred Double Dip® Earning Style and select ‘points and miles’ within your HHonors profile; (3) register online at HHonors.com/airberlinTRIPLE prior to check out; and (4) complete an eligible night stay at any participating hotel or resort within the Hilton HHonors portfolio from September 1, 2014 through November 30, 2014 (Promotional Period). Bonus Mileage: Earn 1 topbonus mile per 1 USD spent per stay during the Promotional Period. In addition, earn 2 bonus topbonus miles for any completed night during the Promotional Period. Allow up to six weeks after qualification, and after promotion has ended, for topbonus miles to be credited to your account. All topbonus program rules apply. Hilton HHonors™ membership, earning of Points and Miles™ and redemption of points are subject to HHonors Terms and Conditions.